A series of public debates are to be held about introducing a system of "presumed consent" for organ donation, says the Welsh Assembly Government. Health Minister Edwina Hart told AMs she wants people to consider Wales moving to an opt-out system. It would mean everyone would be considered as a potential organ donor at death, unless they had registered their objection. Charities and people who have had transplants have welcomed the move. 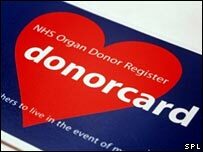 Around three-quarters of a million people in Wales are currently on the organ donor register. But the gap between the number of organs donated and the number of people waiting for a transplant is increasing, the minister said. In a statement, Ms Hart said: "There is a serious shortage of organs in the UK and the gap between the number of organs donated and the number of people waiting for a transplant is increasing." She added: "I have made it clear that I am in favour of considering presumed consent as a way of increasing the number of organ donations. "However, I am also clear that, in the end, this is a matter which must be led by lay rather than clinical opinion and informed by a wide ranging public debate. I have therefore commissioned a consultation document about presumed consent which I intend to launch in the spring of next year. "I want to see a series of public debates all around Wales to ensure that everyone who wishes to participate has an opportunity to do so." She also announced that a publicity campaign will be held in the new year to encourage more people to register as donors. Alison John, an ambassador for Kidney Wales Foundation, who has had three transplants with four organs, said she believed having a presumed consent system is the "only way forward". "Statistics show that only 22% of people in Wales are on the register but yet 90% of people are willing to be on the register, it's just they haven't had the time to register," she said. "So with this system, if you don't want to give your organs after death then you will take the time to take yourself off the register." Roy Thomas, chair of Kidney Wales Foundation, which supports people with kidney disease and has lobbied for the opt-out system, added: "We believe that if people are prepared to accept an organ for themselves or their loved ones then they should be prepared to give an organ to help save someone else's life." Last month a survey by the British Medical Association revealed that two-thirds of more than 2,000 questioned felt the UK should move to an opt-out system. But just over a quarter of the people surveyed said they were on the register.